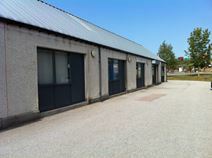 Office Space - Ellon, Aberdeenshire. Based only minutes from Ellon town centre, this property benefits from great road links. The A90 is nearby, offering convenient access to Aberdeen (less than a half an hour drive), Peterhead and Fraserburgh. The office space is fully serviced and is of an excellent standard. There is ample on-site parking and a manned reception who happily provide administrative support. There is a four person office available now on flexible terms at a great price.